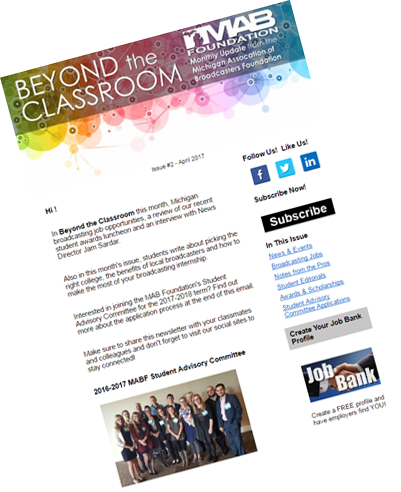 The latest issue of Beyond the Classroom, the MAB Foundation student newsletter has just been sent out. In this issue, there’s Michigan broadcasting job opportunities, a review of our recent student awards luncheon and an interview with WLNS-TV (Lansing) News Director Jam Sardar. And, students write about picking the right college, the benefits of local broadcasters and how to make the most of your broadcasting internship. Read this issue here. Subscribe and receive future issues in your mailbox here.